Jared Kluesner and Mickey Tincher, students in GEOL 389: Introduction to Field Methods, collect a push core in bank sediments near the boat launch at Fairbanks Park in Terre Haute, Indiana. Abstract: The connections between science and society can be used to teach pre-service teachers about science through field trips/fieldwork experiences. This project involved a group of pre-service science teachers who were engaged in examining environmental concerns associated with the presence of heavy metals in their local water supplies. As part of an elementary science methods course, 19 pre-service teachers were divided into groups that conducted fieldwork in a local park. 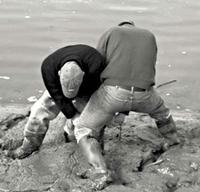 The groups identified environmental problems associated with heavy metals in local river sediments and in park soils. The pre-service teachers collaborated with students in an undergraduate geochemistry class as they collected soil and river sediment samples, collecting other data onsite, and analyzed river water samples. The goals of the project were to introduce all participants to field and laboratory methods, local environmental issues, and the value of working with community partners. A follow-up attitude survey indicates the experience helped the pre-service teachers to recognize that science doesn't only happen in a laboratory environment, and to realize the value of using local community issues to help teach science. The results of this study suggest that all pre-service teachers should have the opportunity to be involved in outdoor settings conducting inquiry activities. These types of experiences reinforce the value of connecting community issues and effective teaching strategies to local environmental concerns. Ahmed, K., 2003, Environmental protection, public health and human rights: An integrated assessment— a report prepared for the Science and Human Rights Program, American Association for the Advancement of Science: http://shr.aaas.org/projects/human_rights/reports/Ahmed2003.pdf (accessed June 3, 2009). Berkowitz, A., Ford, M., and Brewer, C., 2005, A framework for integrating ecological literacy, civics literacy and environmental citizenship in environmental education, in Johnson, E.A. and Mappin, M.J., eds., Environmental education or advocacy: Perspectives of ecology and education in environmental education: New York, Cambridge University Press, p. 227-266. Chun, S., and Oliver, J., 2000. A quantitative examination of teacher self efficacy and knowledge of the nature of science—paper presented at the annual meeting of the Association for the Education of Teachers in Science, Akron, Ohio. Disinger, J., 2005, Environmental educators' definitional problems, in Hungerford, H., Bluhm, B., Volk, T., and Ramsey, J., eds., Essential readings in environmental education: Champaign, Ill., Stipes Publication, p. 17-32. Gill, R., and Burke, I., 1999, Using an environmental science course to promote scientific literacy: Journal of College Science Teaching 29, p. 105-110. Filippelli, G., Laidlaw, M., Latimer, J., and Raftis, R., 2005, Urban lead poisoning and medical geology: An unfinished story: GSA Today 15, p. 4-11, doi: 10.1130/1052-5173,. Hoke, M., 1991, Field-trip tips: A baker's dozen: Science and Children 28(7), p. 20-21. Hoosier RiverWatch: http://www.in.gov/dnr/riverwatch (accessed February 20, 2011). Leary, R., 1996, Field trip tips: Science and Children, 34(1), p. 27-29. Lisowski, M., and Disinger, J.F.,1991, The effect of field-based instruction on student understandings of ecological concepts: Journal of Environmental Education 23(1), p.19-23. Mielke, H.W., 1999, Lead in the inner cities: American Scientist 87. p. 62–69, doi: 10.1511/1999.1.62. Mielke, H.W., and Reagan, P., 1998, Soil is an important pathway of human lead Exposure: Environmental Health Perspectives, 106(1), p. 217–229. Nairin, K., and Higgitt, D., 2000, International Perspectives on Fieldcourses: Journal of Geography in Higher Education, 24(2), p. 246-254. Orion, N., and Hofstein, A.,1991, The measurement of students' attitudes toward scientific field trips: Science Education, 75(5), p. 513-524. Ostuni, J., 2000, The irreplaceable experience of fieldwork, in Gerber, R., and Chuan, G.K., eds., Fieldwork in geography: reflections, perspectives and actions: Boston, Kluwer Academic Publishers, p. 79-98. Palmer, J., and Birch, J., 2005, Changing academic perspectives in environmental education research and practice: progress and promise, in Johnson, E.A., and Mappin, M.J., eds., Environmental education and advocacy: Changing perspectives of ecology and education: Cambridge, Cambridge University Press, p. 114-136. Plevyak, L., Bendixen-Noe, M., Henderson, J., Roth, R.E., and Wilke, R., 2001, Level of teacher preparation and implementation of EE: Mandated and non-mandated EE teacher preparation states: Journal of Environmental Education, 32(2), p. 28, p. 36. Smith, G., 2002, Place-based education: Learning to be where you are: Phi Delta Kappan 83(8), p. 584-594. Stoltman, J., and Fraser, R., 2000, Geography fieldwork: Tradition and technology meet, in Gerber, R., and Chuan, G.K., eds., Fieldwork in geography: Reflections, perspectives and actions: Boston, Kluwer Academic Publishers, p. 37-52. Weiss, I., Banilower, E., McMahon, K., and Smith, P., 2001, Report of the 2000 national survey of science and mathematics education: Chapel Hill, Horizon Research. Wingfield, M., and Ramsey, J., 1999, Improving science teaching self-efficacy of elementary pre-service teachers—paper presented at the annual meeting of the Association for the Education of Teachers in Science, Austin, Texas. "Political officials in some states are beginning to recognize the need for Earth and Space science education across the K-12 curriculum. Case in point: In 2010 Iowa changed teacher certification requirements for K-5 education so that they include a three-credit Earth and Space Science (E&SS) course. In response to this requirement, we developed a hybrid course consisting of a two-credit online component and a one-credit, two-hour lab (Cervato et al., in press) that could serve as a model for others. The students enrolled in this introductory level course are primarily freshman and sophomore elementary education majors. Because of lab space limitations and in order to ensure a manageable student-to-teacher ratio, enrollment is limited to 48 students. The focus of the course was on engaging the students using multiple learning techniques such as active learning, simple experiments using low budget materials, and the use of Google Earth Geotours (Wilkerson et al., 2012)." Cervato, C., Kerton, C., Hassall, L., Peer, A., and Schmidt, A. 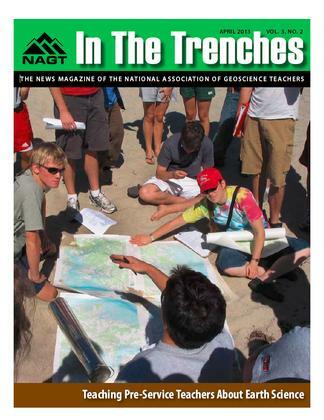 The big crunch: A hybrid solution to Earth and space science instruction for elementary education majors: Journal of Geoscience Education, in press. iRubric, Persuasive letter — Dear president: Public rubric available http://www.rcampus.com/rubricshowc.cfm?sp=true&code=RAX9XX (accessed November 27, 2012). Reynolds, J.A., Thaiss, C., Katkin, W., and Thompson, R.J., Jr., 2012, Writing-to-learn in undergraduate science education: A community-based, conceptually driven approach: CBE Life Sciences Education 11(1), p. 17–25. Wilkerson, M.S., Wilkerson, M.B., and Marshak, S., 2012, Geotours Workbook: New York, W.W. Norton & Company, 161 p.
Teachers and students are using tablets and related devices to access multimedia reference materials and data archives, collect and analyze data, write reports, create graphics, and compose presentations. "It is easy to look at the rapid proliferation of mobile devices in the classroom with some degree of consternation. Cell phones going off in class, students texting during lectures, the seductive nature of online diversions, and the rate at which today's devices become tomorrow's dinosaurs can be quite frustrating. So much so that it is tempting to see these devices largely as a hindrance to what we are trying to accomplish in the classroom." Main navigation screen for EarthViewer. 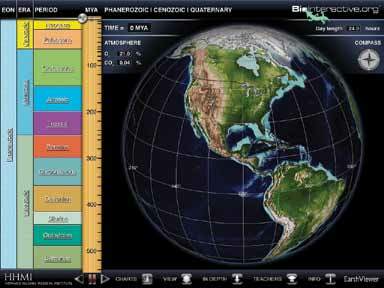 Students can observe changing positions of continents as they move the scroll bar through geologic time or press the forward or reverse “play” button at the bottom of the geologic timetable. In his column on using tablets in Earth science education (see Page 11), Frank Granshaw points out how mobile technologies are impacting students and faculty. If you want to see a good example, download and the install the free EarthViewer App for iPad by the Howard Hughes Medical Institute. With this app, students can explore Earth's history using an easy-to-use interface with excellent graphics that quickly zoom and pan out. They can watch Phanerozoic plate reconstructions from any perspective on the globe while using city locations to help orient them as land masses move. They can also add some key events in Earth's history such as major impact events, significant biological events, and mass extinctions. Users can also add semi-transparent charts to track temperature, oxygen levels, carbon dioxide levels, and biodiversity changes across time. When questions arise, students can refer to the "In Depth" button for more information. Faculty will find this app a simple-to-use learning object for demonstrating a variety of geologic time principles in introductory courses. Make plans now to present your findings at education-related sessions sponsored by the National Association of Geoscience Teachers at the 125th Annual Meeting of the Geological Society of America, October 27-30, 2013, in Denver, Colorado. While there, make your way to the NAGT booth to catch up with colleagues. The methods and ways of thinking that are intrinsic to Earth science differ in important ways from the experimental procedures that are commonly taught in schools as the scientific method. K12 Science is SERC's portal for K-12 Educators. The portal looks across all the project websites hosted by SERC to find the activities and resources of highest interest to K-12 educators. On this site, there are hundreds of classroom activities organized by grade level and topic as well as guidance on effective teaching. Many of these resources were expressly developed with a K-12 audience in mind. Others can be adapted to K-12 classrooms even though they were originally developed with a college audience in mind. Information about the Next Generation Science Standards and a record of the feedback NAGT members provided during their development.